The Magnum 42BR Big Roll Harvesters were the first harvesters introduced 15 years ago by Sammut Agricultural Machinery . Since then, these harvesters have earned a reputation for dependability and performance in a variety of conditions, harvesting a variety of turf grasses. 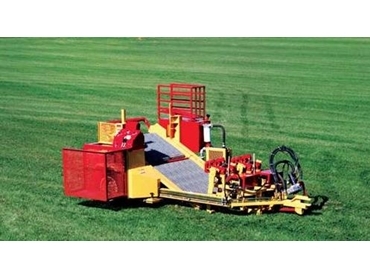 The innovative two-conveyor system of these harvesters provides control over rolling tension and enables operators to pull sod into tighter rolls and stop and start a roll without gaps. The Magnum 42BR Big Roll harvesters are capable of skipping over the bad turf patches and pulling up on the ends with no problems. The patented net application reinforces tender sod and loose soil therefore by harvesting less mature grasses a quicker turn around on the sod is achieved. The net backing allows operators to cut thinner to save soil or thicker as the job requires - from 1/4” - 1/2” to 3”.